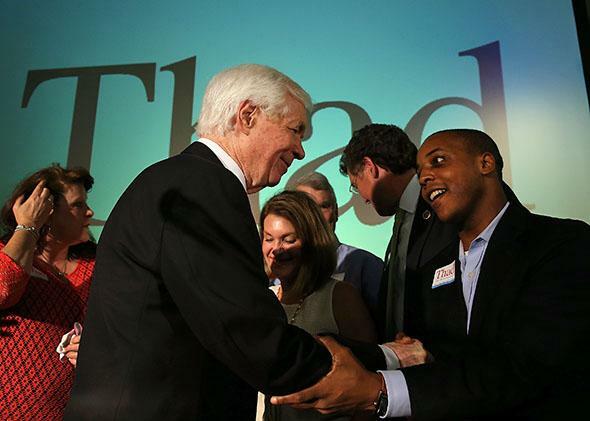 Thad Cochran wins with Mississippi’s black voters: African-Americans help defeat Chris McDaniel. They saw Chris McDaniel for what he is: A classic Southern reactionary. Sen. Thad Cochran greets supporters at his victory party, after narrowly defeating Chris McDaniel, on June 24, 2014, in Jackson, Mississippi. On Tuesday, black Democrats saved an elderly white Republican from political oblivion in the nation’s most racially polarized state. That’s not an exaggeration. On June 3, six-term Sen. Thad Cochran lost Mississippi’s Republican Senate primary to Chris McDaniel, a talk radio host and Tea Party–backed state senator with a long history of divisive and extreme rhetoric. But because of their vote totals—neither candidate broke 50 percent—the race went into a runoff. And the assumption from then until Tuesday was that Cochran would lose. After all, if there’s a rule in American elections, it’s that turnout goes down in a small, obscure contest like a Senate runoff. With his intense grass-roots support and wide backing from national Tea Party groups, McDaniel was the favorite. Between open primaries (anyone can vote in any primary, as long as he or she didn’t vote in a previous one), low turnout in the Democratic Senate primary, and racially polarized voting (the vast majority of whites are Republicans and the vast majority of blacks are Democrats), Mississippi contained a huge number of eligible black voters who could turn the tide if persuaded to vote for Cochran. Yes, by backing Cochran, blacks would guarantee a GOP win in the fall—Democratic candidate Rep. Travis Childers probably had a better chance of defeating McDaniel, with his extremist views, than of defeating Cochran. But Mississippi is the most Republican state in the union; the difference between Cochran and McDaniel is the difference between likely Republican and leans Republican. Either way, Republicans were favored. In which case, black voters had to choose between the man they knew—a relative moderate who deals in earmarks and largess—and a new man. If you know anything about Chris McDaniel, this wasn’t a hard choice. For as much as he’s described as a generic Tea Partier—an angry, abrasive conservative extremist—the truth is a little more complicated. Remember, the “Tea Party” isn’t a single ideology as much as it’s a collection of related ideologies under a single banner. The civil libertarianism of Sen. Rand Paul, for instance, is distinct from the compassionate conservatism of Utah Sen. Mike Lee, which is distinct from the Goldwater libertarianism of Sen. Ted Cruz. Overall, notes Nate Cohn for the Upshot, “Turnout increased by 4,156 votes in the handful of counties where black voters represent more than 65 percent of eligible voters.” White voters also turned out in greater numbers, but given the final results—191,508 votes for Cochran versus 184,815 votes for McDaniel—there’s a strong case that blacks were a necessary part of Cochran’s victory. Right-wing conservatives aren’t happy. Cochran won “through a combination of race-baiting attacks on McDaniel, and touting his ability to make government larger and bring home more goodies from Washington,” wrote John Hayward for Human Events. Following his lead, more than a few bloggers—and a whole lot of tweeters— have accused Cochran of “race-baiting” for making active appeals to black voters. “GOP primary voters in Miss wanted Cochran out. GOP establishment wanted him in. So they turned to Dems & race baiting. But I repeat myself,” said one conservative on Twitter. I think we can agree this is ridiculous. Cochran was well in his rights, and the law, to expand the map of the electorate. To appeal to new groups of voters—to ask them to consider your policies and their impact on their communities—is to play politics in its purest form. Cochran didn’t cheat, he changed the game. And because of his views and his rhetoric, McDaniel couldn’t play.